Background: The transfer of care for hospitalized patients between inpatient physicians is routinely mediated through written and verbal communication or “sign-out”. This study aims to describe how communication failures during this process can lead to patient harm. Methods: In interviews employing critical incident technique, first year resident physicians (interns) described (1) any adverse events or near misses due to suboptimal preceding patient sign-out; (2) the worst event due to suboptimal sign-out in which they were involved; and (3) suggestions to improve sign-out. All data were analyzed and categorized using the constant comparative method with independent review by three researchers. Results: Twenty six interns caring for 82 patients were interviewed after receiving sign-out from another intern. Twenty five discrete incidents, all the result of communication failures during the preceding patient sign-out, and 21 worst events were described. Inter-rater agreement for categorization was high (κ 0.78–1.00). Omitted content (such as medications, active problems, pending tests) or failure-prone communication processes (such as lack of face-to-face discussion) emerged as major categories of failed communication. In nearly all cases these failures led to uncertainty during decisions on patient care. Uncertainty may result in inefficient or suboptimal care such as repeat or unnecessary tests. Interns desired thorough but relevant face-to-face verbal sign-outs that reviewed anticipated issues. They preferred legible, accurate, updated, written sign-out sheets that included standard patient content such as code status or active and anticipated medical problems. Conclusion: Communication failures during sign-out often lead to uncertainty in decisions on patient care. These may result in inefficient or suboptimal care leading to patient harm. Failures in communication between healthcare personnel have been implicated as threats to patient safety in several studies.1–4 These failures also account for over 60% of root causes of sentinel events reported to the Joint Commission on Accreditation of Healthcare Organizations.5 Communication is particularly important but vulnerable to error during times of transition or a “hand-off” from one healthcare professional to another. Previous studies have aimed to define the characteristics of a “hand-off” in a variety of settings and contexts such as nursing shift report, ambulance to hospital transfer, and emergency medicine shift changes.6–9 Another time of transition that requires effective communication is the transfer of care for hospitalized patients from one physician to another during shift changes. This transfer or “sign-out” can refer to either the verbal or written communication of patient information which is designed to familiarize oncoming or covering physicians with patients for whom they will be responsible. The unpredictable course of acute illness during a patient’s hospital stay requires varying levels of care by oncoming or covering physicians. The lack of familiarity of covering physicians with the details of the patient’s illness and hospital stay can make these transition periods especially vulnerable to errors, jeopardizing patient safety.10 This is especially true in academic hospitals which are generally staffed by physicians-in-training who may lack experience and knowledge with which to make informed decisions on patient care during these times of discontinuity. The quality and safety of the sign-out or “hand-off” process in academic hospitals has also come under increasing scrutiny in many nations because of the efforts to reduce duty hours for medical trainees.11–13 The few studies to date which have examined the hand-off process confirm that it is variable, unstructured, and prone to error.12,13 To improve the integrity and quality of this process, the nature and effects of communication failures that may lead to patient harm need to be understood.14 This study focuses on those communication failures that result in adverse events or near misses, defined here as “critical incidents”. Using these critical incidents, this study characterizes the failures in communication that occur during the in-hospital sign-out of patient care between physicians-in-training and suggests areas for improvement. To transfer care of their patients, internal medicine first year resident physicians (interns) at the University of Chicago Hospitals prepare and print a Microsoft Word document with pertinent patient information. These documents are then verbally summarized by departing (primary) interns to covering interns who remain on duty overnight (“on-call”) to provide night coverage for their own patients as well as the hospitalized patients of other interns (“cross-coverage”). Covering interns may refer to and modify these documents with handwritten notes in the margins when patient care issues arise on one of the patients that they are covering during their on-call period. When the primary interns return the next morning, they contact their respective covering intern who is now “post-call” to receive an update of events that occurred overnight and to retrieve the written sign-out document with the updated notes from covering physicians (Appendix 1). Both primary interns and covering interns were privately interviewed by an investigator (VA) without prior notification of the purpose of the interview after one night of cross-cover care on patients. The critical incident technique was used to solicit communication failures during verbal and written sign-out. Initially developed to study aviation accidents, this technique can broaden knowledge of sparingly documented or poorly understood areas using factual reports of an individual’s observation of their own behavior or of others.15,16 To identify communication failures that possibly led to patient harm, interns were asked to identify and describe near misses or adverse events that took place either as a result of a poor written or verbal sign-out from the preceding shift (box 1). They were also asked to describe the most severe adverse event they could recall in the past year due to a suboptimal sign-out and, lastly, to evaluate their peers’ written and verbal sign-out and suggest areas of improvement. 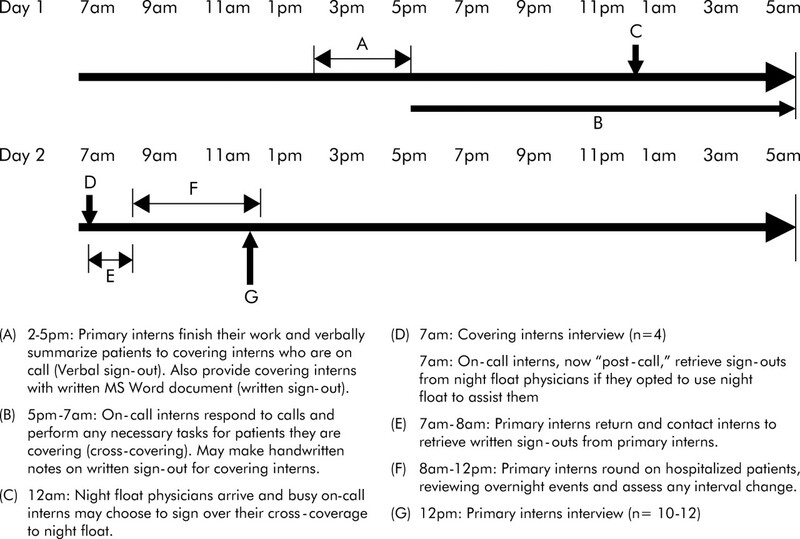 Covering interns were interviewed at 7 am on their post-call day and primary interns were interviewed starting at noon on the day of receiving the sign-out from covering interns (fig 1). Timeline showing interview procedure for interns. To ensure all interns were experienced with cross-coverage at the time of the interviews, interviews were conducted in the last quarter of the academic year. To minimize the effect on future behavior, interviews were only performed on the last weekday of the month-long inpatient general medicine rotation. Because interns rotate on the inpatient general medicine service more than once, the last weekday of the months of March and June were chosen to provide an adequate sample of representative interns while attempting to reduce the number of interns who would be interviewed more than once. All interview data were stripped of identifying information and replaced with labels to reflect intern’s call status (covering or primary) and unique voice (1, 2, 3, etc). These data were then reviewed by three investigators (VA, JKJ, DL) and analyzed by the constant comparative method.17 Using this inductive approach with no a priori assumptions, incident reports were compared using a stepwise approach.18 Firstly, data from each incident were categorized during an open coding process. Secondly, incidents were compared across interviews to yield integration or refinement of categories, including grouping related categories or creation of sub-categories. By using the core or main categories that emerged, this categorical scheme was then selectively applied to all the data. Kappa statistics were used to determine inter-rater agreement for the categorization of critical incidents by the three independent reviewers. Reconciliation of all discrepancies was achieved by consensus. The Institutional Review Board of the Biological Sciences Division of the University of Chicago approved this study. All 30 interns who rotated on the inpatient general medicine service in March and June 2004 were eligible for participation in the study. Of these, 26 interns collectively caring for 82 patients were interviewed after two different call nights. Twenty five distinct incidents were reported, all of which were the result of a communication failure in the written or verbal sign-out from the preceding shifts. Interns also reported 21 worst events due to deficient sign-out that occurred in the preceding year. Inter-coding agreement for categorization of incidents was high with kappa statistics ranging from 0.78 to 1.0 per category. Two major categories referred to the contributing factor in the communication failure. One was referred to in the analysis as “content omissions” in which critical information needed to care for a patient was not communicated, either verbally or in writing, during the hand-off process. Incidents in this category could be further classified as: (1) failure to report an active medical problem; (2) failure to report a medication or other treatment; (3) failure to report pending or ordered diagnostic tests or consults (table 1). Of these, the most common was a failure to report an active medical problem. In several cases this active medical problem had already been worked up but covering interns felt that they were “starting from scratch”. The other major contributor to communication failures referred to failure-prone communication processes. This was further divided into three sub-categories (table 1). In at least two events, interns cited lack of face-to-face communication as a factor in a critical incident. In two other events, primary interns reported that handwritten notes on the written sign-out from covering interns were unclear or illegible, leading to confusion regarding a patient care issue. Lastly, in three events interns described a failure in communication resulting from the use of a second covering resident physician referred to by the intern as “night float”. The night float physician, who may care for patients between midnight and 7 am, results in an additional hand-off for each patient in a 24 hour period as follows: (1) primary intern to covering intern; (2) covering intern to night float; (3) night float to primary intern. In all of these events an initial covering intern had recorded illegible comments or made unclear verbal comments to a night float physician. The following morning the primary intern received no verbal communication from the night float physician regarding these events, resulting in the primary intern having actively to seek out the initial covering intern. In examining the reports of worst events caused by poor sign-out, omitted content remained the dominant category (table 3). In the 21 worst events described by these interns, seven were the result of failures to communicate an active or ongoing medical problem. Specifically, omission of a patient’s code status, either written or verbally, was a major sub-category. In all five of these events a patient with a “Do Not Resuscitate” order was actively resuscitated because the written sign-out did not contain the code status for the patient. Another type of omission referred to events in which the rationale of a decision of the primary team was not communicated, such as why antibiotics were not started. This category was reserved for those failures that were not the direct result of omitted patient data or information but instead were characterized by failure to communicate the reasoning of the primary team to the covering intern. These events often resulted in a covering intern questioning a decision made by the primary team or not understanding why it was made. In suggesting areas of improvement for verbal sign-out, comments were classified into four major categories (table 4). The most frequent suggestion was to verbally communicate any anticipated problems that may occur overnight. Interns also suggested that a thorough verbal sign-out that reviewed relevant medical problems was needed for effective patient care. Lastly, interns suggested that this communication should occur face-to-face. Several of these suggestions were also noted in areas of improvement for written sign-out—namely, the need to include anticipated problems and relevant information. However, there were certain suggestions unique to the improvement of written sign-out. Interns suggested that written sign-outs should contain code status, baseline mental status, pending tests, consults, and procedures (table 5). Interns often use their written sign-outs as “to do” lists to remind them of their work in progress, or what psychologists refer to as a “cognitive artifact” or a tool to aid in the recollection of various tasks related to the workflow of an intern.19 However, this use may interfere with the primary function of written sign-outs, to provide information and guidance to covering physicians during care for patients. This study of critical incidents describes a categorical scheme with which to classify communication failures during sign-out of patient care between physicians-in-training and makes suggestions for improvement. This taxonomy of communication failures and potential improvements may be informative in designing educational and system based interventions to improve the quality of sign-out (table 6). One approach to standardization of written sign-out is the use of sign-out templates. These sign-out templates could include required fields for high yield content, such as code status, to prevent content omissions. A more technologically oriented approach to standardization described by others is a computerized sign-out system.21,22 A computer based system can definitely improve legibility and potentially reduce content omissions through the use of standard fields. Higher level functions such as prompts to update information or interfacing with existing patient data repositories may also be helpful improvements. However, it is important to recognize that a technological solution cannot alone substitute for a successful “communication act”.23 Effective verbal communication is still important to ensure proper transmission of information. For instance, the replacement of a telephone call for reporting critical laboratory values in an emergency room with an electronic results reporting system with no verbal communication resulted in 45% of emergency laboratory results going unchecked.24 The use of more structured verbal communication such as “read-backs” during telephone calls of critical laboratory results has been shown to decrease errors in telephone laboratory reporting.25 Lack of or ineffective verbal communication at the time of hand-offs has emerged as a common theme surrounding adverse event and near miss situations in nursing.26 These findings, in conjunction with this study, suggest that proper verbal communication during sign-out is important for safe patient care. For this reason, standard educational programs should be considered to train residents to communicate effectively at the time of hand-offs. The richness and effectiveness of face-to-face communication in the context of hand-offs in medicine and other industries should be emphasized.27,28 The need for complete but relevant sign-outs reflects the delicate balance between delivering too much or too little information, a sentiment also expressed by nurses for their verbal communication during “report” or shift change.29 Achievement of this skilful verbal communication during sign-out may require adoption of standard language.30 One possible tool to facilitate this is the Situational Debriefing Model, otherwise known as “SBAR” (situation, background, assessment, and recommendation). This model, which originated in the Navy, can be used in health care to improve communication of critical information in a timely and orderly fashion.31 The use of critical incident analysis and peer evaluations, as described in this study, is a potential way for teaching and improving resident sign-out. This study has several limitations. Firstly, it examines the sign-out processes of a group of interns at one teaching hospital. Because of variability between institutions in mechanisms of sign-out or coverage systems, this study is limited in the extent to which it is generalizable. However, given the frequency of sign-out, these findings do enhance the limited existing literature by providing a framework and method for evaluating communication failures in this process. Secondly, these findings are subject to limitations of the critical incident interviews. It is possible that expectation-led interviewer effects, although reportedly minimal, may have influenced the data collection.32 These effects, which occur when the interviewer may inadvertently influence respondents to produce outcomes consistent with a priori expectations, would manifest itself as an increase in the number of communication failures reported. However, given the reliability and predominance of categories that emerged, it is less likely that the distribution of types of failures would change significantly. It is also equally possible that the identity of the interviewer (in this case a former chief medical resident) may have influenced data collection.33 For example, underreporting of communication failures due to concerns for a perceived potential of disciplinary action for peers may have limited incident reporting. To minimize this effect, interns were informed that all data would be stripped from any identifying information and restricted only to investigator use during the consent process. In addition to these limitations, data on sign-out quality in this study are limited by the content of the interviews. Supplementation with methods such as direct observation or audio recording, which may impair this process initially through observer effects, would probably yield a richer data set over time.34 For instance, we lack detailed data on the place, time, length, or presence of interactive questioning of the verbal communication that took place, all of which could be obtained using formal observation. Unfortunately, the use of these alternative methods would be costly given the sporadic nature of sign-out and the time to code field notes and audiotapes. In restricting this study to critical incidents, the data and observations are subject to hindsight bias or oversimplification of factors that led to error due to retrospective analyses.35 We may overlook more complex system factors that were involved in a failed communication such as workload, time, environment, and attitude. For these reasons, this study is by no means definitive but, instead, a preliminary attempt to understand the communication failures that occur during sign-out. To understand this complex process, further research should be undertaken with an emphasis on studying system factors and human performance in a broader context rather than through failures alone.36 Lastly, the results from this qualitative study cannot be statistically projected across a population. However, the methods and framework presented can be used to inform future quantitative studies that can assess rates and types of failures, or quantitatively evaluate the effect of an intervention such as computerized sign-out or a verbal sign-out educational program. Communication failures during sign-out are often characterized by content omissions or failure-prone communication processes. These failures often lead to uncertainty in decisions about patient care which may result in inefficient or suboptimal care. A taxonomy of effective and poor sign-out is presented which may be informative in designing educational and system-based interventions to improve the quality of sign-out. The general medicine inpatient service consists of eight teams of one attending, one resident (second or third year house staff), and two interns (first year house staff). Teams are designated by a letter (A, B, C, or D) and number (1 or 2). Teams designated with the same letter perform their required extended duty hour shifts (“call”) on the same day, every fourth day. These extended shifts are from 8 am to 8 am the following day, at which time the intern is “post-call”. During the on-call period, interns designated with the same number are responsible for caring for patients on the other three teams in their assigned numerical group after those teams leave the hospital. For example, intern A1 takes call on Monday with intern A2, but is responsible for all of the patient care (also known as “cross-coverage”) for interns B1, C1, and D1 after those interns leave the hospital. The official transfer of care between the primary intern to the covering intern, who is on-duty or “on-call”, takes place through both a handoff process known as “sign-out”. This sign-out can refer to the verbal communication at the time of the handoff and/or to the written Microsoft Word document that contains a synopsis of the primary intern’s patients. The next morning, primary interns return from home and contact the covering intern, who is now “post-call”, to retrieve their written sign-out and receive a verbal update of any critical issues. The authors thank Vivian Chang, Carrie Dunphy, and Jennifer Higa for their excellent research assistance. Wilson RM, Runciman WB, Gibberd RW, et al. The quality in Australian health care study. Med J Aust 1995;63:458–71. Lingard L, Espin S, Whyte S, et al. Communication failures in the operating room: an observational classification of recurrent types and effects. Qual Saf Health Care 2004;13:330–4. Sutcliffe KM, Lewton E, Rosenthal MM. Communication failures: an insidious contributor to medical mishaps. Acad Med2004;79:186–94. Department of Health. Organisation with a memory. Report of an Expert Group on Learning from Adverse Events in the NHS. London: HMSO, 2000. Joint Commission on Accreditation of Healthcare Organizations. Sentinel event statistics. Available at: http://www.jcaho.org/accredited+organizations/sentinel+event/sentinel+event+statistics.htm (accessed 1 May 2005). Lally S. An investigation into the functions of nurses’ communication at the inter-shift handover. J Nurs Manag 1999;7:29–36. Beach C, Croskerry P, Shapiro M. Center for Safety in Emergency Care. Profiles in patient safety: emergency care transitions, Acad Emerg Med2003;10:364–7. Thakore S, Morrison W. A survey of perceived quality of patient handover by ambulance staff in the resuscitation room. Emerg Med J2001;18:293–6. Peterson LA, Brennan TA, O’Neil AC, et al. Does housestaff discontinuity of care increase the risk for preventable adverse events? Ann Intern Med 1994;121:866–72. Mukherjee S. Becoming a physician: a precarious exchange. N Engl J Med2004;351:1822–4. Roughton VJ, Severs MP. The junior doctor handover: current practices and future expectations. J R Coll Physicians Lond1996;3:213–4. Bomba DT, Prakash R. A description of handover processes in an Australian public hospital. Aust Health Rev2005;29:68–79. Cook RI, Render M, Woods DD. Gaps in the continuity of care and progress on patient safety. BMJ2000;320:791–4. Flanagan JC. The critical incident technique. Psychol Bull1954;514:327–59. Gremler DD. The critical incident technique in service research. J Serv Res2004;7:65–89. Boeije H. A Purposeful approach to the constant comparative method in the analysis of qualitative interviews. Quality and Quantity2002;36:391–40. Glaser BG, Strauss A. Discovery of grounded theory. Strategies for qualitative research. Sociology Press (http://www.groundedtheory.com/index1.html) 1967. Volpp KG, Grande D. Residents’ suggestions for reducing errors in teaching hospitals. N Engl J Med 2003;348:851–5. Joint Commission on Accreditation of Healthcare Organizations. Joint Commission announces 2006 national patient safety goals for ambulatory care and office-based surgery organizations. 2005. Available at http://www.jcaho.org/news+room/news+release+archives/06_npsg_amb_obs.htm (accessed 1 September 2005). Petersen LA, Orav EJ, Teich JM, et al. Using a computerized sign-out program to improve continuity of inpatient care and prevent adverse events. Jt Comm J Qual Improv 1998;24:77–87. Van Eaton EG, Horvath KD, Lober WB, et al. A randomized, controlled trial evaluating the impact of a computerized rounding and sign-out system on continuity of care and resident work hours. J Am Coll Surg 2005;200:538–45. Ash JS, Berg M, Coiera E. Some unintended consequences of information technology in health care: the nature of patient care information system-related errors. J Am Med Inform Assoc2004;11:121–4. Kilpatrick ES, Holding S. Use of computer terminals on wards to access emergency test results: a retrospective audit. BMJ2001;322:1101–3. Barenfanger J, Sautter RL, Lang DL, et al. Improving patient safety by repeating (read-back) telephone reports of critical information. Am J Clin Pathol 2004;121:801–3. Ebright PR, Urden L, Patterson E, et al. Themes surrounding novice nurse near-miss and adverse-event situations. J Nurs Admin 2004;34:531–8. Patterson ES, Roth EM, Woods DD, et al. Handoff strategies in settings with high consequences for failure: lessons for health care operations. Int J Qual Health Care 2004;16:125–32. Cockburn A. Agile Software Development Boston: Addison-Wesley, 2002. Kerr MP. A qualitative study of shift handover practice and function from a socio-technical perspective. J Adv Nurs2002;37:125–34. Leonard M, Graham S, Bonacum D. The human factor: the critical importance of effective teamwork and communication in providing safe care. Qual Saf Health Care2004;13 (Suppl I) :i85–90. British Medical Association. Safe handover: safe patients. Guidance on clinical handover for clinicians and managers. London: BMA, Available at http://www.bma.org.uk/ap.nsf/Content/Handover/$file/Handover.pdf (accessed 22 December 2004). Clarke P, Sproston K, Thomas R. An investigation into expectation-led interviewer effects in health surveys. Soc Sci Med2003;56:2221–8. Chew-Graham CA, May CR, Perry MS. Qualitative research and the problem of judgement: lessons from interviewing fellow professionals. Fam Pract2002;19:285–9. Holden JD. Hawthorne effects and research into professional practice. J Eval Clin Pract2001;7:65–70. Henriksen K, Kaplan H. Hindsight bias, outcome knowledge and adaptive learning. Qual Saf Health Care2003;12 (Suppl II) :ii46–50. Cook RI, Woods DD, Miller C. A tale of two stories: contrasting views on patient safety. Chicago, IL: National Patient Safety Foundation, 1998, Available at www.npsf.org/exec/report.html (accessed 1 May 2005). ↵* Question repeated for verbal and written sign-out. This research was supported by the Department of Medicine at the University of Chicago. BMJ Quality & Safety 2005; 14 393-393 Published Online First: 02 Dec 2005.